A new variety of ‘super rice’ bred in southern China has broken the world record for rice production, Chinese state media has reported. The new breed produced of 13.9 tons of rice per hectare, more than double China’s average rice yield (a hectare is roughly the size of the field area inside a standard running track). The trials were carried out in the southern province of Hunan, according to the China Daily newspaper. The creator of the rice, Yuan Longping, has been breeding new rice varieties since the 1970s. He’s achieved minor celebrity in China, and it’s estimated that breeds developed by Mr. Yuan now account for up to 60 percent of China’s rice. The record-breaking rice is classed as a hybrid, rather than a genetically modified variety, because it was produced without using modern genetic techniques. Sales of GM rice are banned in China, but China’s ministry of the environment admitted to the existence of an illegal trade in GM rice seeds. According to a report by Chinese newspaper Southern Weekend cited by AFP, an investigation by four government departments found that because of weak management “illegal GM seeds are present in several provinces”. 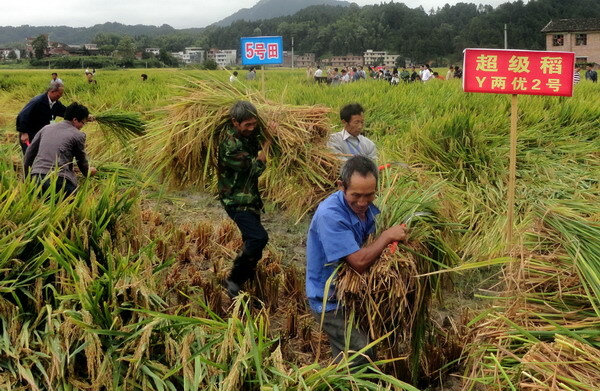 More productive rice-fields could help the Chinese Government achieve its food security aims. Beijing has a policy of self-sufficiency in the production of grains, including rice, which it considers to be a matter of national security. China’s rice production rose 2% last year, but imports of rice were also unusually high, at around 1.5 million tons, mostly coming from neighboring Vietnam. “Overseas purchases of corn and rice… have revived fears over Beijing’s potential to influence global agricultural commodities markets,” the Financial Times reported. The new variety of rice is not the only breed of ‘super rice’ competing for space in the world’s rice paddies. Thai scientists are working on breeds which are more resistant to disease, according to the China post. This year, a research team in California invented a kind of GM rice which is resistant to drought and flooding. As yet there are no reports on what the new breed of rice tastes like.